Adding to its growing catalog of technology innovations, OneFire, Inc. has released a mobile game that is designed to work on all iOS platforms including the new iPad Air 2 and iPad Mini 3 released on October 16. Giving a nod to the proliferation of Asian Carp in Illinois waterways, the "What the Fish?!" game allows users to compete against their friends in a fun and crazy flying fish game. In "What the Fish?! ", the player is driving a boat down the river and punching as many fish as possible without missing more than three. By hitting more fish, players unlock Game Center achievements. Players start the game punching fish with a fist, but can upgrade and purchase man-made "fishing" tools such as a shotgun, crossbow, dynamite, and more. "What started as a simple teambuilding project in our office has turned into an awesome game that puts a creative spin on the many ways used to fish Asian carp" said Jason Parkinson, OneFire Vice President and COO, "Our email is blowing up faster than the fish since we released the game earlier this week." The "What the Fish?!" 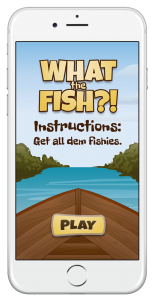 game is available as a free download in the Apple App Store or by visiting http://1fi.re/whatthefish. It is compatible with iOS devices including iPhones, the iPod Touch and iPads.